In Old English White with black leather interior. 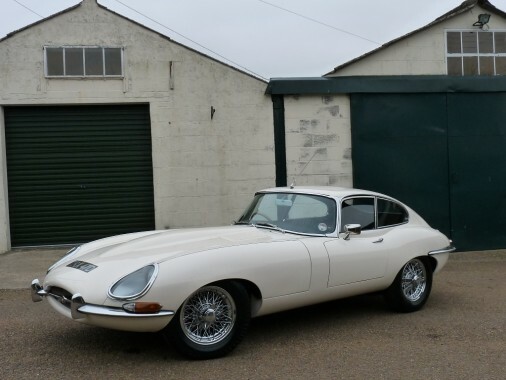 This UK matching numbers E type was restored in the early nineties with invoices in the comprehensive history file detailing over £50,000 of work undertaken. When E-Type UK last sold the car they fitted a large alloy radiator, a 123 electronic ignition kit, EBC green brake pads and an uprated anti-roll bar. Recent works have included a full rear suspension overhaul and new brakes front and rear (£5,000), an Etype UK Fabs 5 speed gearbox (£6,600) and a full carburettor rebuild and further rear suspension and brake work (£5,400) resulting in a superbly well set up E Type. The five speed gearbox suits the car very well. The car has been part of a stable of Jaguars owned by a local enthusiast and he has used it recently for road rallies including last year's Scottish Malts in which it finished strongly. It remains in excellent condition throughout and is ready for the numerous events available to E Types or some serious continental touring. It is a superb driving car, the nicest E type that we have driven, and, whilst not a pristine show queen, is in very nice order throughout.